I spotted this ani at Santa Ana National Wildlife Refuge as it was drinking water at the edge of North Lake. I came around a corner and it was only 10 feet in front of me but it quickly flew into the thick vegetation. After vocalizing it flew up into a tree where I got the top 2 pics. 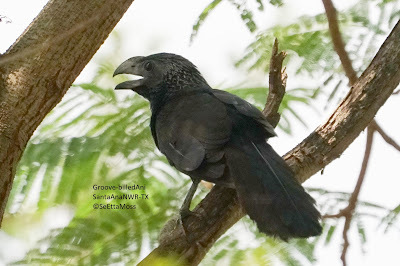 I saw my first Groove-billed Anis in Costa some years ago but an experience that is still clear in my memory. As I was wandering alone around the town of Monteverde so it was my own discovery not just a bird pointed out to me by a guide. I heard a second ani vocalize in the vegetation near the tree and the first ani flew in there providing me with the above photo. Unfortunately the thick vegetation made getting a focused photo not possible but it was too neat to get 2 anis together to not include this pic. I am so very thrilled to post about that my photo just above is displayed in the Texas Wild Exhibit which is a permanent exhibit in the Witte Museum in San Antonio, TX. This is the only photo I have ever sold and the only time I have asked to submit some photos for consideration for display in a museum. 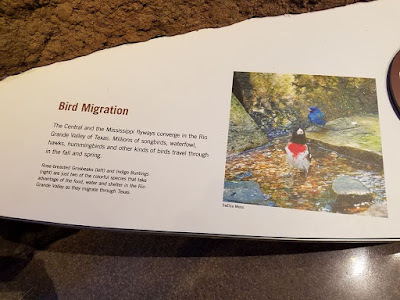 I visited the Witte Museum for the first time this week and took these cell phone photos of my photo above and in the Rio Grande Valley display below as well as a number of other displays in the Texas Wild Exhibit. I was delighted to get to meet Helen Holdsworth, the Curator of Texas Wild, who follows this blog. Above is a taxidermied ocelot, an Endangered species found in the Rio Grande Valley in small numbers. Above is a Harris' Hawk, coyote and Northern Bobwhite. The pic above was taken from the second floor of the museum which has a large opening to the floor below. Starting above with the Crested Caracara and pics in section below are from South Texas Thornbrush. 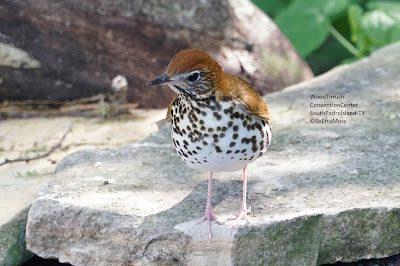 Wood Thrush bathing on South Padre Island,TX from SeEtta Moss on Vimeo. This Wood Thrush is vigorously bathing in the video above, much deserved after flying hundreds of miles over the Gulf of Mexico. 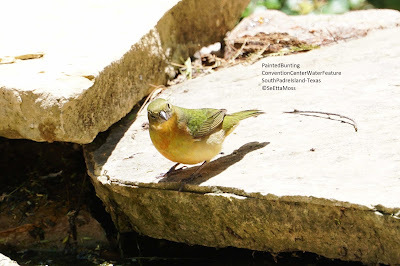 It is wonderful that local birders have provided this important migration stop over on South Padre Island in cooperation with the adjacent Convention Center that allows the plantings and the water feature to provide for tired, hungry and thirsty neotropical migrant birds like this. I photographed this young Painted Bunting on South Padre Island in early May when a lot of neotropical migrants were stopping over so I couldn't keep up with them all. I believe this is an immature male as in addition to the greenish upperparts there is almost reddish feathering on it's underparts.